Deputy chairman of management board of Trust Bank arrested in Russia | Russian Legal Information Agency (RAPSI). MOSCOW, May 21 (RAPSI) – Deputy chairman of management board of Trust Bank, Oleg Dikusar, has been arrested on suspicion of embezzlement, RIA Novosti reported on Thursday. Trust Bank - Russia's 32nd largest lender by assets according to Interfax data - reported losses in 2014 amounting to 18.8 billion rubles ($377.6 million) amid financial crisis. As of December 1, 2014, its assets were estimated at over 290 billion rubles ($5.8 billion). The Central Bank decided that Trust Bank should be bailed out with the assistance of the Deposit Insurance Agency. 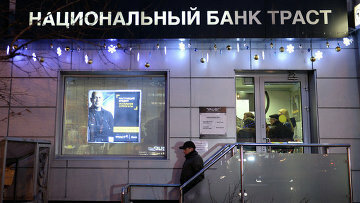 Russian authorities said they would provide up to $2.4 billion in loans to bail out Trust Bank. Otkritie Financial Corporation Bank, which is the parent company of Otkritie Financial Corporation Banking Group, was chosen as an investor for the financial rehabilitation of the troubled bank. A criminal case against several former Trust Bank top managers who allegedly conspired to embezzle the bank’s funds by transferring them abroad under fraudulent loan contracts was opened in April. Over 7 billion rubles and over $118 million were fraudulently transferred to Cyprus, according to investigators. 10:32 21/05/2015 Deputy chairman of management board of Trust Bank, Oleg Dikusar, has been arrested on suspicion of embezzlement, RIA Novosti reported on Thursday.